Winning Control of the House Runs Through California! 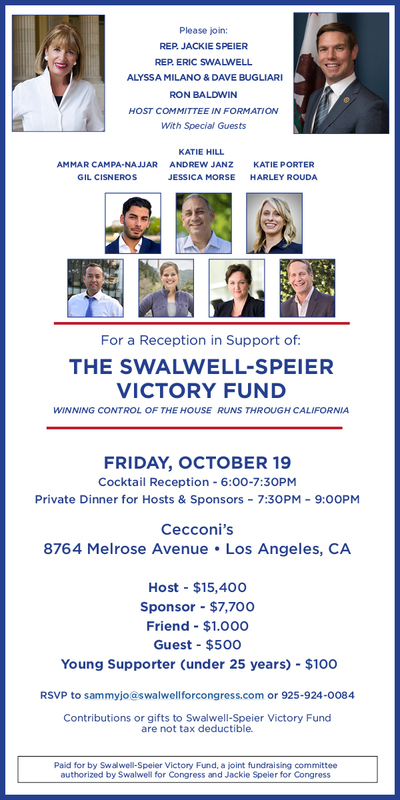 Contributions to Swalwell-Speier Victory Fund will be allocated as follows: The first $ 5,400 of each contribution from a person will be divided equally between Swalwell for Congress and Jackie Speier for Congress. The next $ 10,000 of each contribution from a multicandidate committee will be divided equally between New Energy PAC and Vision for America. Any contributor may designate his or her contribution for a particular participant by contacting whitney@whitneyburns.net. The allocation formula above may change if any contributor makes a contribution that, when allocated, would exceed the amount that the contributor may lawfully give to any participant.